It’s Loving Day, folks, and we might as well make it a whole darn weekend of happy mixing, because Asian Americans really had more of a role in the legendary Loving case than you think. It wasn’t just a white/black thing, as I’ll explain in a bit. For those of you stuck in a Kim and Kanye World, I know, it’s hard to imagine a time when people didn’t just hook up when they felt like hooking up. But it’s true. The hooks were different then and could get you jailed. Back in the day, anti-intermarriage laws were present throughout the U.S. Whites couldn’t marry blacks. And Filipinos or Asians. With Whites? Don’t even think about it. Sure, taboos tend to make things spicier, but oh so illegal. And while laws were passed in 1948 to allow for race mixing in California and some other states, the anti-miscegenation laws didn’t really come off the books until Loving v. Virginia. That’s the case in which Richard Loving, a white male from Virginia, married Mildred Jeter, an African American female, in Washington, D.C. in 1958. When they later returned to Virginia, they were promptly arrested. They pleaded guilty and fought all the way to the Supreme Court for their right to marry. 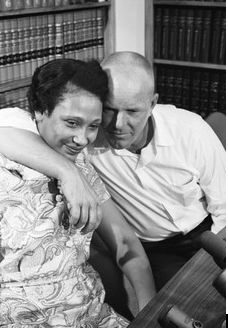 On June 12, 1967, the Supreme Court unanimously ruled that the ban on interracial marriage was a violation of the Fourteenth Amendment. HIrschkop, who has practiced law for more than 50 years, said the Loving case was simple, as there were no trials or depositions. But the impact of the case was huge. One of the little known facts of the Loving argument is how Asian Americans informed Hirschkop. 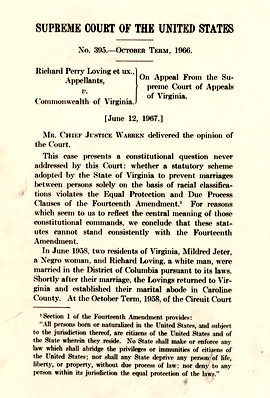 It involves the case of Naim v. Naim, in which a Chinese sailor, Han Say Naim, met his wife Ruby, a white woman living in Virginia, and then went to North Carolina to be married on June 26, 1952, simply because of Virginia’s ban on all interracial marriages. North Carolina didn’t ban white and Asian marriages. They returned to Virginia and lived as husband and wife for a year. But then Ruby Naim filed for an annulment based on the Virginia Racial Integrity Act of 1924. Her husband, Han Say Naim, argued for the validity of his marriage, reportedly concerned for his immigration status. His lawyer, David Carliner, wanted to challenge the Virginia law. The case went all the way to the Virginia Supreme Court, which ultimately backed a circuit court decision and sided with Mrs. Naim. The decree appealed from is affirmed. With that, from June 13, 1955, there would be no question on Virginia’s ban on white and Asian marriages. Naim took the case to the Supreme Court, but his timing was wrong. It was one hot potato at a time. The Court had just ruled on the monumental Brown v. Board of Education case. But in honor of the Naim case, Hirschkop said Naim’s lawyer, David Carliner, was included in the Loving court papers. “Naim was a terrible opinion, because it talked about “bastardization of the races,” the same ugly reasoning, same ugly language that the court applied to black/white was definitely applied to Asian Americans,” Hirschkop said. Hirschkop mentioned one other situation as being integral to the Loving argument–the fervor of the 1920s and 1930s that resulted in anti-miscegenation laws in California left the largely male Filipino population, brought in as laborers, in a sexual limbo. Hirschkop also pointed to one irony that stays with him to this day. 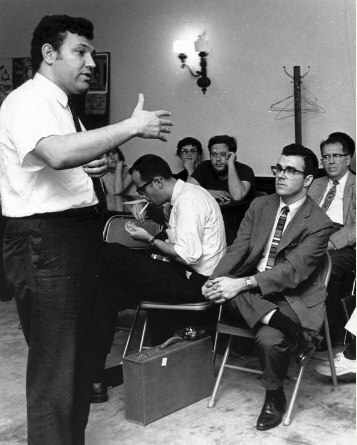 “We came out of World War II and Asian Americans were in a horrible situation,” Hirschkop said. “We locked out the Nisei. Everyone west of Denver was locked in a concentration camp. And one odd contradiction… the man who wrote the Loving opinion, Chief Justice Earl Warren, was attorney general of California and signed the document that locked up the Japanese Americans in California.” Indeed, the JACL was well represented with attorney William Marutani arguing in the Supreme Court as an amicus in the Loving case. For now, it’s pretty daunting to realize that none of it could have happened without Loving. When you think of all the hate we’ve all had to overcome, just to get to first base, we should pause and remember Loving Day on June 12th, and the anniversary of the Naim decision on June 13th. It’s worth an extended weekend to celebrate and affirm our right to love and marry across racial lines.